Get ready for truly responsive performance. 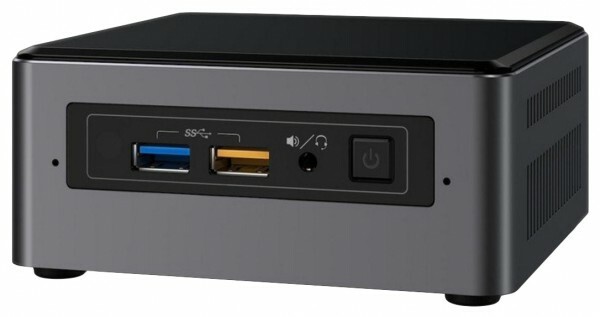 The IntelÂ® NUC Kit NUC7i5BNH is built with a dual-core 7th Generation IntelÂ® Coreâ„¢ i5 processor. So youâ€™ve got the performance to turn the IntelÂ® NUC into a powerhouse of productivity and play, streaming your favorite movies and music, or running analytics. With dual-array front microphones, you can take full advantage of WindowsÂ® 10 and Cortana. IntelÂ® Irisâ„¢ Plus graphics transform the viewing experience with 4K Ultra HD video and premium content playback, enabling new ways to enjoy the latest Hollywood blockbusters. And the multi-color LED ring lets you personalize your NUC with the look you wantâ€”making it at home in the living room, den, office, or any place you can imagine. Room for up to 32 GB of DDR4 RAM lets you increase performance easily. Also features a 2.5" drive bay for an SSD or HDD with up to 2 TB of storage space. OEM products must be purchased with a PC. No Microsoft Office products are available for this computer at this time.